We decided to visit one of Rome’s famous landmarks – The Spanish steps. The subject of several movies that made it popular, these steps are one of Rome’s many symbols. While the tourists went to see the steps themselves, for the Romans it is a popular shopping hangout. Let us start at the top of the Spanish Steps. At the top -start at Piazza di Trinita dei Monti. The Church of Trinita dei Monti that dominates this square is a French church in the city built in 1503 and modified over time. Earlier, a slope brought people down to the square below before the steps were built. And now about the Spanish Steps themselves – You may want to ask why are the Spanish Steps in Rome? Well, the Piazza di Spagna or the Spanish square at the bottom has the Spanish Embassy which was based there since 1967 and therefore the name. The steps were built by Francisco de Sanctis as a result of a contest held by Pope Innnocent XIII after arguments of over a 100 years on how to build the steps! The staircase has 135 steps and is the widest staircase in Europe. The twelve flights of stairs built entirely in Travertine by Fransesco De Sanctis between 1723 and 1726, widen and narrow in varied stages but in line with rococo architectural concepts. You may be tempted to eat on the Spanish steps, but please don’t! It is forbidden and you don’t want to pay a hefty fine! A horse carriage ride anyone? ..Although the poor horse can’t open his mouth and has an eye patch. The Piazza di Spagna is the square at the bottom when you descend. This square is more of two triangles like an hourglass and not really a square! If you look up the Church of Trinita dei Monti looms large in the backdrop of the steps as you descend making for a picturesque setting. There are also side ramps or more stairs that run alongside. 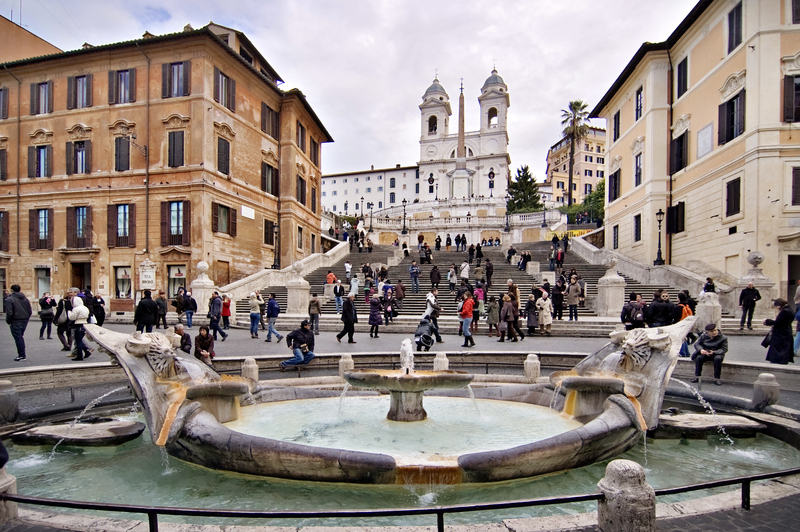 At the center of Piazza di Spagna is the Fontana della Barcaccia set against the backdrop of the steps. Unfortunately this fountain was all covered when we were there and we couldn’t see it. Below is a picture though. The Fontana della Baraccia I mention above means ‘Ugly Boat’. 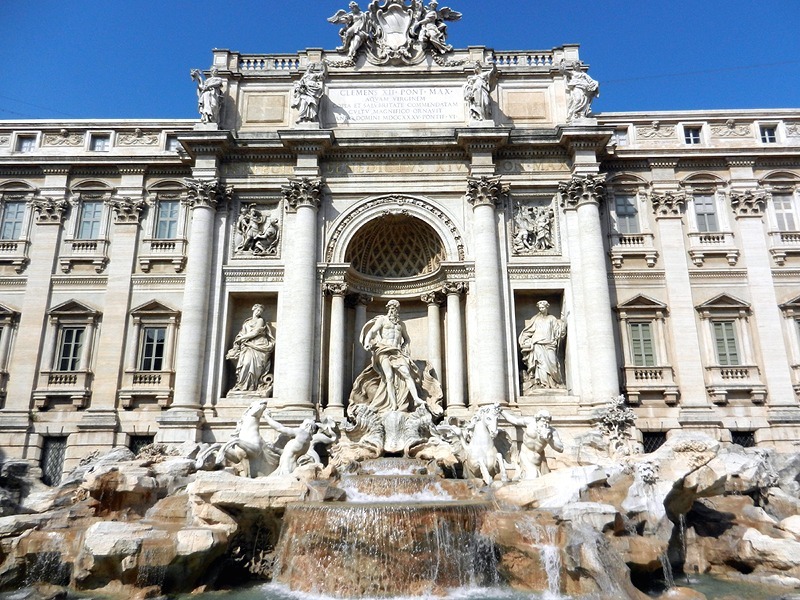 It was built by Pietro Bernini (father of the more famous architecht Gian Lorenzo Bernini). This boat is a representation of a sinking boat leaking water at the stern and prow. Let me let you into a secret now. For all the romanticism around the Spanish steps, I only found hype. It was a crowded place, with all the room on the steps taken with photographing tourists. A few horse carriages and the portrait artists at the top were nice. But what was nicer was to escape the hordes into smaller alleys near the steps with little restaurants and gelaterias. Well, if it hadn’t been for the huge number of steps I have climbed to reach the top of various temples in India, I might have found the Spanish steps a big deal. They make for many a postcard of Italy and should be best enjoyed at wee morning hours or late night before the hordes of tourists descend on them making them pretty invisible in the throng. Next: How we took the wrong turn but got good surprises. Continuing the ‘Travelling with a Toddler’ series, here is the concluding part on Sightseeing and everything else you need to know. Most developed countries have decent footpaths and walkways, so it is a great idea to carry a pram (stroller) while you sightsee. It is very likely that you will be out for long hours, and your baby may be able to sleep in it. A good quality stroller that has a good suspension system for bad roads and one that reclines fully and half way for her to sleep comfortably is an absolute must. You are going on a vacation with your kid. Don’t just visit museums and churches that she understands little of and will be impatient to leave! Also take her to the nearby park, the beach or wherever else she would enjoy too! Ask the tourism office for kid-friendly places and they will tell you a host of places. We took SSS to little parks in the neighborhood wherever we were, lounged around in open squares where she enjoyed playing and gave her space and time to enjoy her vacation too! The most important of them all – Go slow! If there are ten things you need to see in 2 days, rest assured you will be able to do only 4 or 5! Either extend your trip or prioritize the places you want to see. Between your baby’s nap times, food times, play time and tired time, you certainly won’t be able to see it all! You can also consider splitting a few places with your travel partner such as climbing 400 steps of a cathedral where it may not be a great idea to take her. Let him see what interests him while you look after the baby and you see what you like while he takes care of her. And..we took her up those 300 odd steps in St Peter’s Basilica and I don’t know how I made it! First aid/Medicines – Talk to your pediatrician and find out what medicines you should carry if required in a foreign country. Also carry the receipts for these if they are required in customs. Pack light – It is highly probably that your kid’s bag is heavier than your own with extra clothes, toys and diapers! You need to compensate by packing light for your own baggage! Buy at your destination – Don’t pack what you can buy at your destination. Such as extra diapers apart from those you will require while travelling and for a day more, certain food stuff etc. Time zone changes – For a substantial difference in time zones you will have to give her two-three days to adjust to a new timezone. Manage your schedule accordingly. I hope this series was helpful if you are planning to travel with a kid. Although, as someone said, it may scare others into not travelling with a baby! Happy Travelling! There are two types of travelers- First are the ones who plan and execute it all on their own and the second are the ones who outsource the planning and execution and go with a travel operator on a well planned trip. Both have their pros and cons – While it is time consuming to plan your own travel arrangements, itinerary and accommodation, it offers far more flexibility and you can spend your time the way you like it. However a planned tour by an agency will take care of all your needs but you need to stick by their rules, schedules and itineraries. We belong to the first category of travelers. We decide what we want to see, do all our planning, book our tickets, figure out where we want to stay, use a map to figure out where to find anything, and enjoy exploring on our own! I am going to give you a few pointers on everything that needs to be planned through in this space. Italy being a part of the European Union requires a Schengen Visa for Indian citizens which needs to be given atleast 15 days of processing time before one can fly. The Visa list simplifies what needs to be get done – Airtickets, Insurance, accommodation and internal travel arrangements and having your finances in order is what is required. You can find the complete list of documents required here. The process of submitting a visa application is fairly simple and one need not go through any travel agent. Just take all the required documents with two copies of everything, fill up the forms also available on the online, visit the VFS office that manages Schengen applications and submit the documents. It should not take more than two hours to do that. Once the visa is stamped, you can collect it from the same place. In Mumbai, there is no need for any appointment for a Schengen Visa and one can just go directly walk into the VFS office in BKC to submit the documents. Booking flights – I expect we could have found sweeter deals in our flight booking had we booked earlier, but well, we didn’t plan well. But if you are reading this, and would like to plan a trip to Italy, watch out for International discount days at major carriers from three months in advance and you may just land a deal as sweet as Rs 25-30K return fares as did some co-travelers. Accommodations – Here is the thing about Europe where lodging is concerned..As compared to India where decent hotels can get astonishingly expensive at not less than Rs 8K a night, in Europe there is a vast range of places one can book for all sorts of budgets. From hostel accommodations for the solo intrepid travelers, to lavish suites at 5-stars and the mid-range hotels ranging from Rs 3K-8K, it is easier to find a place in the heart of the city. One just needs to look out for the right place. And it is not just hotels and hostels. A vast segment of tourists prefer to rent a home for a few days through sites such as airbnb or booking.com. This further increases the options around the sort of neighborhood you would like to live in and the kind of amenities you can have and one can experience life the locals lead. With a one year old in tow, we had little choice but go for homes that had kitchens we could use for our little picky eater (though we are pickier about what she eats!). Sightseeing and reservations: Italy is a destination that sees millions of tourists every year. All the major tourist places are inundated with these hordes of tourists and you will encounter long lines to get inside anywhere. But some pre-planning can help avoid these long lines. What needs to be done is make reservations early on or buy the City Tourist Passes. Since there are a lot of options and a lot of places where you may need reservations, I am going to keep this for another post, you will be soon able to read. Finally, only our packing remained and this is the most important piece of all. Whatever you do, travel light! Pack few clothes and do your laundry and well, shop in Italy! If you however need those four pairs of shoes to match your outfit, be prepared to lug your suitcases on the roads and through stairways in places such as Venice which has no cars. Italy in three words is Art, Food and Touristy! As I look back on my recently concluded trip at the beautiful country of Italy, so many images flash by – Pizza at the Piazzas, religion in Renaissance, art with architecture, hordes of tourists, leisurely outdoor lunches, chilling out with Gelatos, the symphony of the bands playing at the square, the grandeur of the Colosseum, my one year old daughter SSS chasing fluttering pigeons.. Through this blog I am going to take you through our trip right from how we planned it out and how we should have planned it out! Why did we choose to go to Italy? Italy was a dream travel destination for many a year for me. Three reasons finally saw us zeroing on Italy – Good weather, Amazing art and Culture and great Food! And thus.. Italy fit all our expectations and we locked down our air tickets about a month in advance. Once our return flights were booked, the next step was deciding the places we wanted to see in Italy and book our accommodation accordingly. Italy is a country with points of interest for varied tastes. One may want to see every major Art gallery there is in places such as Rome and Florence, or visit quaint towns in the country such as Lucca or Pisa, or do a wine tour at Tuscany or click a photo of the Coliseum and move on to the next tourist destination or hike in the scenic coastal town of Cinque Terre. There is much for everyone and it is quite necessary to prioritize based on what one likes! What did we finally see? With a baby in tow, we decided to stick to the tourist trail and not the off-beat trail. We also decided to take it easy and enjoy the vacation instead of simply hopping from one site to another. Italian cities have a lot of history and culture in them and we finally decided to visit Rome, Florence and Venice as our key destinations. If at all we had time, we could make day-trips around these places to places such as Pisa, Lucca or a trip to the famed Tuscany countryside.